What a weekend it has been. Keith and crew arrived in town on Saturday morning and we headed straight to Bourbon. Hurricanes were had by all. The quarter was alive with Saints buzz and everyone was in great spirits. From the quarter, we headed uptown to catch a parade and then right on to Superior Grill for their fajitas. Sunday started with a big breakfast and brought about the same trip. 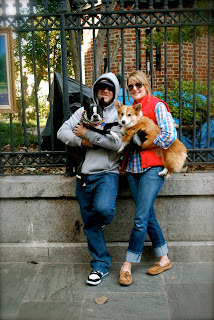 Back to the quarter, this time for Barkus and more reveling, followed by the Superbowl. Win or lose, the game was going to be exciting. Well, the Saints one. We dropped everything and headed to the quarter. We just wanted to be a part of history in the making. We took a bus and hitch-hiked to get there, but get there we did. I can't even begin to describe the scene, take Mardi Gras, throw in some love and hugs, and a super bowl win, then add a dash of high-fives. Top it all off with music and dancing. That's what it was like. Complete chaos.